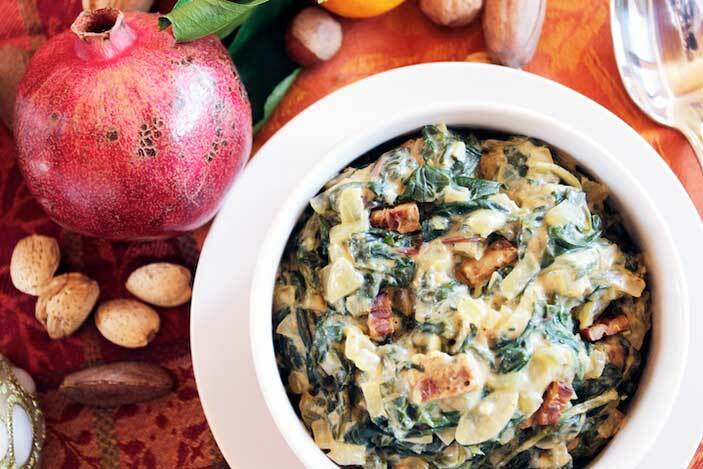 This flavorful vegan creamed spinach is so yummy, you won’t believe it’s vegan. 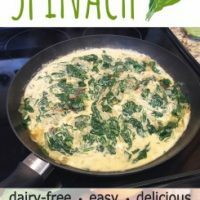 Yes, it is possible to make a delicious, creamy, vegan creamed spinach recipe without added fat or bacon. Let's be honest, we love the taste of fat and bacon but we know it's not in the best interest of our health. So, are you willing to try something new or are your taste buds still adjusting? This recipe is so creamy you won’t miss all the unhealthy fat. Coconut milk is good in this dish but you can use one of the other options listed. If you’re feeling experimental you could even add some spice or try a bit of curry. You could try a spin on the Indian dish, saag paneer but without the cheese they use. By adding the Indian herbs and spices you’ve kept the same great recipe but now with a wonderful new flavor profile. This is a great way to get this recipe in the rotation again, you won’t regret it. If you're moving in the direction of eliminating animal products, good job! I know at times, it's not easy. Sometimes you struggle with the little devil sitting on your shoulder encouraging you to "go ahead and just eat it... you'll do better tomorrow." 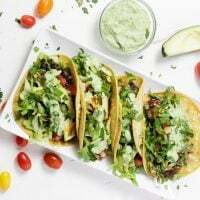 I believe that one of the secrets to maintaining a diet you love (not really a diet, but a lifestyle of eating) is having foods that you love. So, let's add this to your list of recipes that make the cut and also, make you healthier. 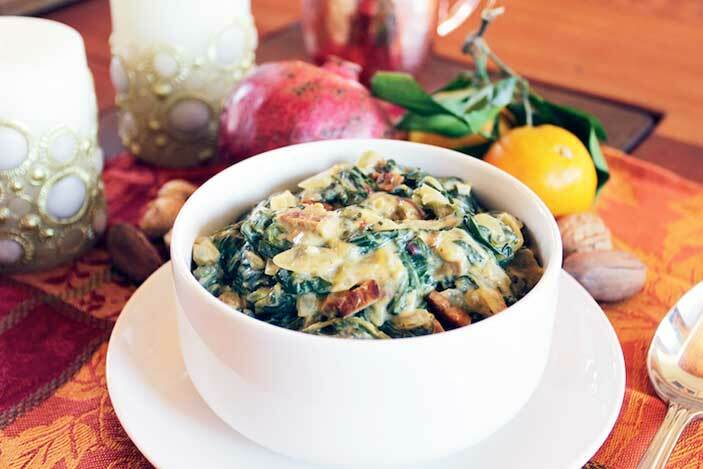 Feel guiltless eating this creamed spinach and make it a tradition to years to come! 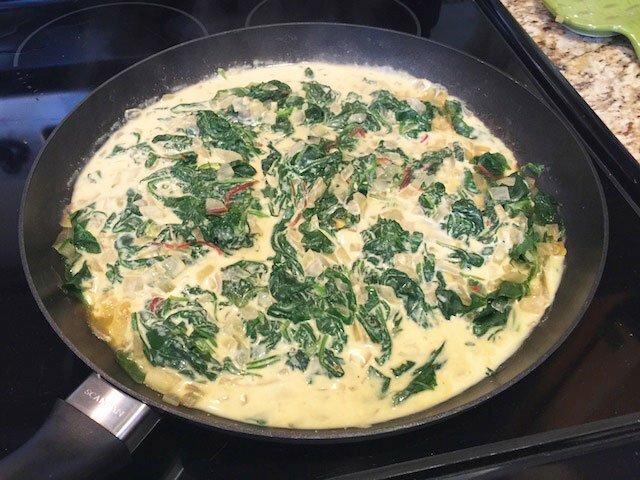 I'd love to hear your feedback in the comments below for this Vegan Creamed Spinach recipe! If you have a photo, post it on my Facebook page, tag me using the hashtag #plantbasedcooking in your caption, and I won't miss it! This savory dish is a great addition to your holiday meal. The tempeh bacon is optional. Use left-overs over toast for a satisfying meal. In a large pan, add 1/2 cup vegetable broth and the chopped onions. Saute until the onions start to turn translucent. Add garlic and sauté another minute. Add the fresh spinach and continue to cook until it starts to wilt, adding more broth to keep it from sticking. 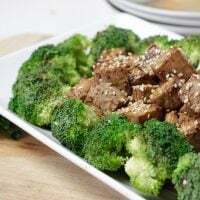 In the meantime, pan-fry the slices of tempeh bacon or place them on a silpat and into a 350° F oven for about 8-10 minutes until they start to turn brown and caramelize. Flip them over half way through. Remove and set aside. In a separate small bowl, whisk the non-dairy milk, mustard, nutritional yeast, cornstarch and nutmeg if using. Add to the pan with the spinach and stir continuously until the sauce starts to thicken. If it's too thick add a little more broth. Add in the tempeh bacon, if using, and stir just to combine. Looks like a great recipe, I’m about to start making it now. Love the metric measurement for the stock: 118 5/17 ml, where do I get a measuring cup with 17th ml on it? Perhaps try rounding to the nearest ml to look authentic. Ha, I know, it’s crazy. I use an automated feature that doesn’t translate imperial to metric rounded but that’s a great suggestion. There are so many kinds of plant milk to choose from these days and they’ll all do a good job of making the dish creamy, however, it’s probably the amount of fat that will really make the difference. If you’re ok eating more fat, coconut has the most although it could affect the flavor. Otherwise, soy milk has 3.5 gms per cup compared to almond milk with 2.5 grams. I feel like cashew milk has the most neutral flavor so you might consider that, as well. I make mine with soy milk and have found it to be quite creamy. I hope that helps. Thanks for responding. Will give it a try! I made this tonight for supper along with a sweet potato and some mushroom patties. I made it as posted, divided it between 2 bowls, and my “greens shy” hubby ate his whole bowl and liked it! This is a win, win! Can’t thank you enough for something so simple and so healthy! This is going to be made over and over again in this house! Thanks for the feedback and great to hear that it’s “hubby” approved! I’m not a vegan but made this dish for Christmas due to having several vegans in our family. It was absolutely amazing! I can honestly say I even prefer it to any of the non vegan creamed spinach dishes I’ve had. This is definitely going and my archive of go to side dishes. Hey Emily, your comment means a lot to me, thank you so much and I’m so glad to hear you enjoyed it! !